Silkroad & Aparna Ramaswamy | Who's in the Lobby at Juilliard? Caroline Shaw, Musician and Composer | Who's in the Lobby at Juilliard? Pulitzer Prize-winning composer and musician Caroline Shaw performs selections from By & By with Juilliard students. Musicians Chris Thile, Edgar Meyer, and Stuart Duncan stop by Juilliard for a short performance and Q&A with Juilliard students. 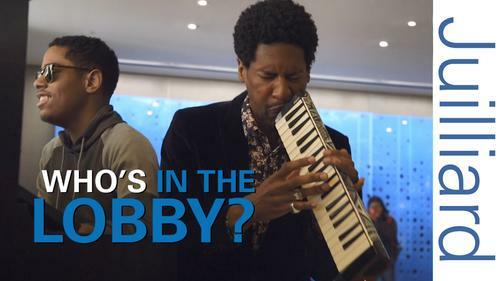 Jon Batiste | Who's in the Lobby at Juilliard? Musician and alum Jon Batiste stops by the lobby to perform with pianist and special guest artist Matthew Whitaker. 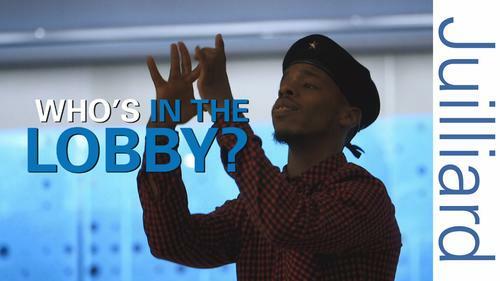 Lil Buck & Silkroad | Who’s in the Lobby at Juilliard? 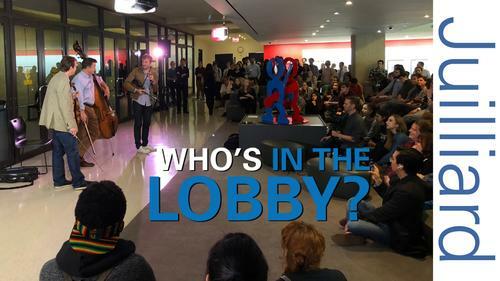 Lil Buck and Silkroad musicians gather in Juilliard's June Noble Larkin Lobby to perform for—and with—current students. Watch highlights from Juilliard's 2018 Convocation, the first with President Damian Woetzel. Damian Woetzel, Juilliard's seventh president, addresses the Juilliard community during the school's convocation on September 4, 2018. On July 1, 2018, Damian Woetzel became the seventh president of The Juilliard School. Woetzel has taken on multiple roles in arts leadership since retiring in 2008 from a 20-year career as a principal dancer with New York City Ballet and as a dancer on the international stage. During his distinguished dance career, he was lauded for performances in a range of roles created by George Balanchine and Jerome Robbins, and he had works choreographed for him by Robbins, Eliot Feld, Susan Stroman, Twyla Tharp, and Christopher Wheeldon among others. From 2011 until this year, Woetzel was the director of the Aspen Institute Arts Program, which aims to further the value of the arts in society; he is also the artistic director of the Vail Dance Festival, which annually brings together a wide range of dancers and musicians and focuses on fostering new collaborations and commissions. An independent director, choreographer, and producer, Woetzel’s recent projects include DEMO, an interdisciplinary series at the Kennedy Center; Spaces by Wynton Marsalis (’81, trumpet; artistic director of Juilliard Jazz) for Jazz at Lincoln Center; Lil Buck @ Le Poisson Rouge, featuring Lil Buck, Yo-Yo Ma (Pre-College ’71; Professional Studies ’72, cello), and an array of other stellar musicians; televised Kennedy Center Honors tributes to Natalia Makarova (2012), Patricia McBride (2014), and Carmen de Lavallade (2017); an arts salute to Stephen Hawking for the World Science Festival; two Turnaround Arts performances at the White House; and the first performance of the White House Dance Series, which was hosted by Michelle Obama. Woetzel has collaborated on numerous initiatives with Yo-Yo Ma, including the Silk Road Connect program in the New York City public schools and Arts Strike, a pioneering format for artists to engage in public service. In 2009, Woetzel became the founding director of the Jerome Robbins Foundation’s New Essential Works (NEW) Program, a five-year program that initiated grants to enable the production of 35 new dance works. In 2009, President Obama appointed Woetzel to the President’s Committee on the Arts and Humanities; he served until 2017 and worked on creating the Turnaround Arts Program, which brings arts education to challenged school districts across the country. Woetzel holds a Master in Public Administration degree from Harvard’s Kennedy School of Government and has been a visiting lecturer at Harvard Law School. He received the Harvard Arts Medal in 2015, and in spring of 2018 was announced as a new member of the American Academy of Arts and Sciences. Juilliard alums practice their craft on stages around the world—and in less expected ways, too, like recording seatbelt-warning chimes.